Price comparison is hot, hot, hot this year, since we all worked out that this VAT cut will only save us £2.50 for every £100 we spend. Moneysupermarket is one of the best known sites out there, and they’ve got something rather special up their sleeve for those brave enough to take on London’s Oxford Street for their Christmas shopping. They’ve rigged up an interactive window, where you’ll be able to enter your product and have the price comparison from thousands of retailers whizzed back to you. The website is projected as a hologram onto the window, which is in turn rigged up to recognise even gloved-fingers touch on the on-window keyboard. It’s launching on Thursday 27th November, and it’ll be available until Sunday 7th December. To find it just head to 129-131 Oxford Street. 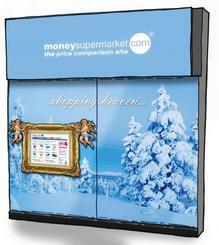 In the meantime, you can check out Moneysupermarket here.